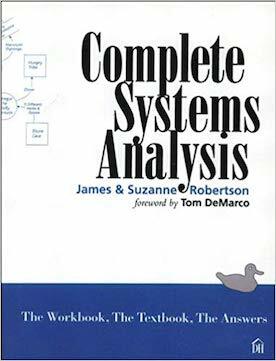 Complete Systems Analysis is a book that teaches systems analysis by having you, the reader, work through a significant case study. Along the way, you visit chapters that discuss various techniques and give you a solid knowledge of how to do it. You work along the path that you select — easy, medium, advanced — so that you are never floundering, nor are you restive because it is too easy. “Clearly the best book available for teaching modern systems analysis to practitioners. It is equally strong in explaining techniques and in the underlying principles.” Rich Cohen, STARSYS Inc. Available from Amazon as a paperback and from InformIT as an e-book. A sample chapter is available for download.